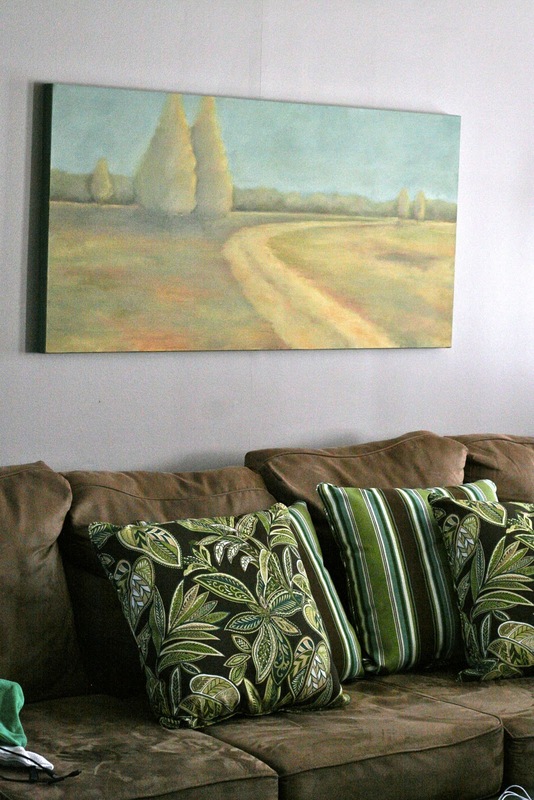 A few years ago my friend Ashley painted this beautiful landscape for our den. I love, love, love it, and when Emily A. Clark finished the design plan for our den (which I have yet to implement), she chose this painting as the focal point of the room. Emily chose fabrics that coordinate with the painting and pull out all the wonderful colors in it. I can't afford to purchase everything I need to redesign the room right now, but recently at Costco, I ran into some pillows that feature the same colors in the fabrics that Emily had chosen. Now, these aren't my long-term solution. I am SOLD on the fabrics that Emily chose for me, and I'll buy them as soon as I can. BUT. These pillows were two for $15. So I got four for $30. And that, Internet, is hard to beat. Because the sun was shining directly on the painting when I took these pictures, the colors look a lot more vivid in the pillows than in the painting. But in person, they actually coordinate quite well. The turquoise and greens in the pillows are almost exactly the same shades as the ones in the painting. And the browns are a nice blend of the ones in the couch and the ones in the painting. Bottom line, for $30, I think these pillows were a steal! I really needed to replace the old rust/yellow/green ones anyway, and these are a great fit. 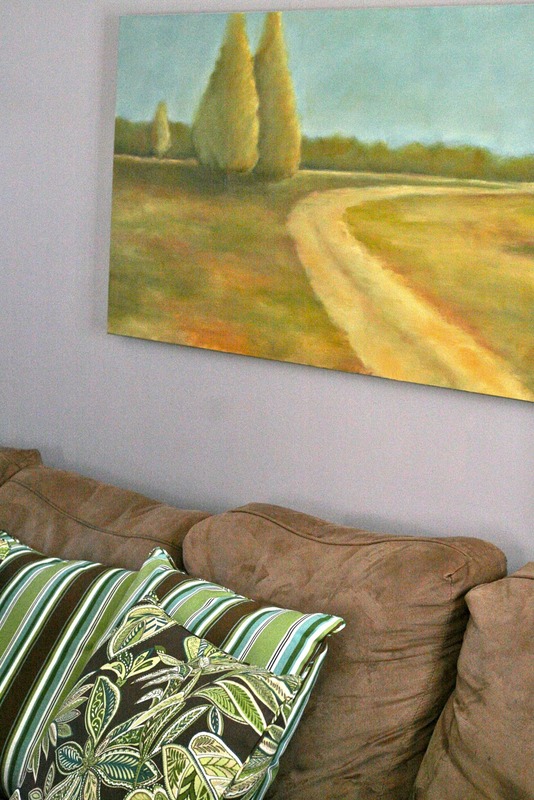 That painting is amazing & I think the pillows coordinate well with it. Good buy on the pillows, I would have picked them up too!